With the extra kit comes a slighty bigger price tag. Topline: For 2019, the second-generation Mazda CX-9 mid-size crossover SUV gets a wide range of upgrades including Apple CarPlay and Android Auto, a reworked suspension, and a slight bump in price over the 2018 CX-9 models. What you need to know: The entry-level Sport model, priced at $32,280, may be the least expensive of the range, but it is rather well-equipped. As standard comes 18-inch alloy wheels, a seven-inch infotainment screen with revised Commander control knob, LED headlights and tail lights, one-touch power windows, rear privacy glass, three-zone climate control, Bluetooth, keyless entry, and push-button start. It even gets automatic emergency braking and Blind Spot Monitoring with Rear Cross-Traffic Alert. The optional $1,290 Sport Package adds a power driver’s seat, heated front seats and side mirrors, automatic headlights, Lane-Keep Assist, Lane-Departure Warning, radar cruise control, and rain-sensing wipers. Higher up the line is the Touring model, marked at $35,330, which features pretty much everything you get with the Sport model coupled with the Sport package and then some. The listed extras include a power liftgate, leather upholstery, eight-inch infotainment screen, two second-row USB ports (each 2.1 amps), HomeLink, and Smart City Brake Support with Pedestrian Detection. 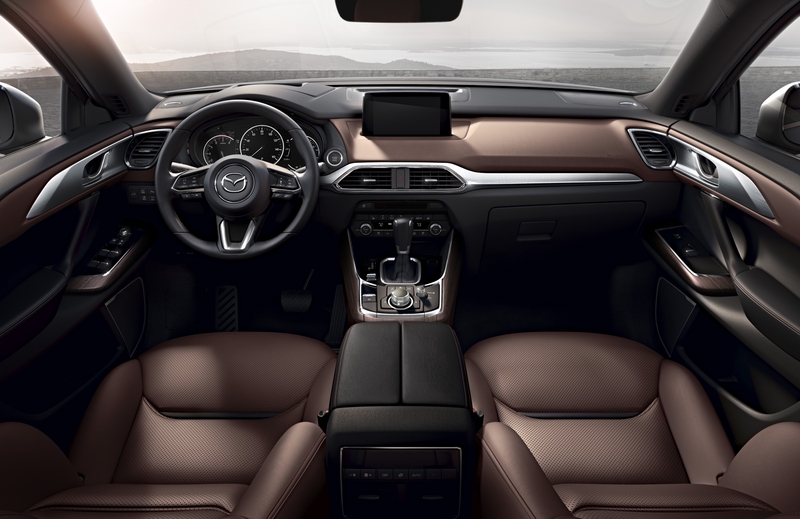 The highlight for the 2019 Mazda CX-9 Touring however, is the factory-installed Android Auto and Apple CarPlay which will help serve as your smartphone-mirroring functions. You also get a frameless auto-dimming rearview mirror. If you're willing to shell out more dough, you can opt for the Premium Package which adds power moonroof, Bose 12-speaker audio system, SiriusXM with a three-month trial subscription, LED fog lamps, navigation, and second-row retractable sunshades. What's new for 2019 is the SiriusXM Travel Link Services, which relays live traffic, weather, sports, fuel pricing updates. Quite oddly, you do get parking sensors, but only in the front. This package is going to cost another $2,390. The $40,840 Grand Touring model adds a new seven-inch TFT reconfigurable gauge cluster display—first seen in the 2018 Mazda6 mid-size sedan—ventilated front seats, new power mirrors, and a new 360° View Monitor. This adds to the standard feature listing that consists of Adaptive Front-lighting System, chrome exterior accents, roof rails, windshield wipers de-icer, 20-inch wheels, Active Driving Display with Traffic Sign Recognition, heated steering wheel, LED door-pocket, and overhead illumination. This one gets front and rear parking sensors. 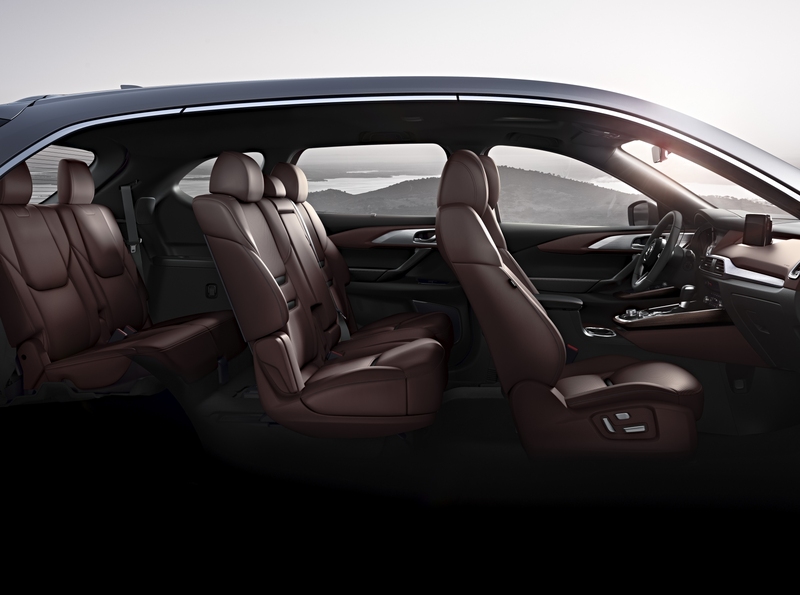 Sitting at the apex of the Mazda CX-9 hierarchy is the Signature model. For a relatively hefty price tag of $45,365 you get new rear badging, LED grille lighting and some luxury bits like Auburn Nappa leather, a hand-stitched and leather-wrapped “chidori” steering wheel and new Santos rosewood interior trim. What’s underneath it all: From a mechanical perspective, the changes are minimal. The suspension setup has been refined to offer a smoother and quieter ride, and there is added sound deadening in the form of a thicker headliner and thicker floor mats. Both powertrains and their output remain the same as before. Under the hood is the familiar Skyactiv-G 2.5T turbocharged engine that delivers up to 250 horsepower on 93-octane gas and 227 horsepower when running on lower-grade 87-octane gasoline. Maximum torque remains the same at 310 pound-feet regardless of octane rating. 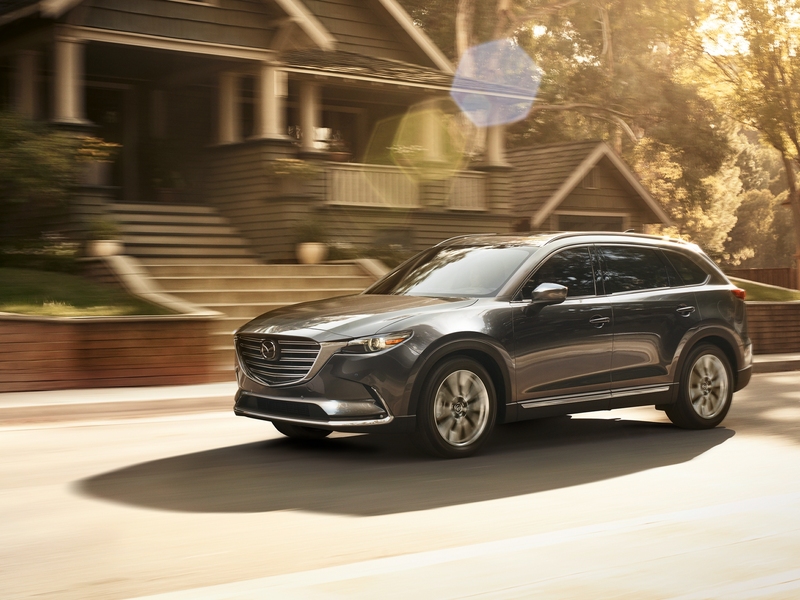 All CX-9 models translate torque into motion via a six-speed automatic transmission and the power is distributed to all four corners via the i-ACTIV all-wheel drive system which is standard in CX-9 Signature and optional with all other trim levels. It adds another $1,800 to the bottomline. When it’ll be released: Only select U.S. dealerships will receive the revised 2019 Mazda CX-9 this August. Others will have to wait till September. Dealers to install upgrade for Touring variants and higher trims at no extra cost, starting this September. This surveillance vehicle which will be used to patrol the beaches of Romagna even touts a machine gun holder. Both editions of this full-size SUV get darkened looks. One gets more brawn.